Sourcing from Sony live cameras, the PWS-4500 in its standard setup can perform instant slow motion replay from 2x and 3x in HD. With an optional high-frame-rate license this can be increased to 4x, 6x or up to 8x HD and 2x UHD. The PWS-4403 remote panel is ergonomically similar to the EVS remote (which in turn is similar to the Ash Vale remote) and allows easy control of slow-motion via a jog dial, fader lever, and pushbuttons. An important additional feature is the ability to selectively select HD video sequences of any desired length from any section of a UHD source, meaning 4:1 pan/scan zoom with no loss of HD resolution. Each cut out sequence uses key frames referenced to timecode, position and zoom level. Live zoom is also selectable. This is ideal for working with live content such as remote sports coming in via an IP link because the editor is fully shielded from latency issues. The server can also encode HD proxy files from a UHD source. The share-play feature allows clips to be viewed or played out directly from connected PWS-4500 servers via a dedicated 10 GbE IP network. Operators can then audition or play clips from other connected servers without needing to transfer a copy. This is a game changer for workflow management that enables a new level of creativity for the operators. A rarely needed but useful feature of the PWS-4500 is a data restoration function which rescues the file if mains power is lost or inadvertently switched off before a file is properly terminated. Only one second would be lost in that case. This risk applies to practically all modern disk and solid-state recorders but generally recovery time is much longer, resulting in more content loss. IP connectivity is rapidly growing in importance and Sony's 'IP Live' capabilities are designed to co-exist with SDI-based production infrastructures, carrying 4K video, audio, reference signals and control data with low latency over a single network cable. Adding an optional IP Interface board provides easy integration with IP Live environments, increasing workflow flexibility and significantly reducing operational costs. Network Media Interface (NMI) is supported and ST-2110 media transport support is on its way. 12G-SDI is also supported with the latest interface board introduced in October 2018. External device connection is both easy and highly flexible. Figure 1 shows a typical configuration for UHD recording and Figure 2 for UHD playout. The PWS-4500 comes in a 427 x 174 x 541 mm standalone housing weighing 22 kg and is designed to record images in Sony's XAVC, DNXHD or ProRes. Supporting accessories include the PWSK-4403 USB remote control panel, PWS-100PR1 production controller, PWS-100MG1 media gateway station, PWS-110RC1 recording software and a selection of option boards with board-specific software. Standard storage capacity is 2 terabytes of flash RAM, allowing six hours of UHD recording or 24 hours of HD. This can be expanded to 8 terabytes by adding extra memory boards. The server can record up to eight HD channels or four UHD channels. UHD workflow is recorded as a single XAVC file to simplify postproduction. Codec options for Apple ProRes and Avid DNxHD 220x/145/45 are available. The front panel is commendably simple with just four elements: an on/standby button and indicator, a system indicator, an access indicator and a network reset switch. Set up, configuration and control are all performed via a connected computer running a Google Chrome browser. When combined with a touch screen, the replay and clip management operations become very fast. The server can be operated from the graphic user interface or by via the remote control panel. The operating status of all boards is clearly shown on the home screen, supplemented by a status-alert screen, system screen, port screen, file screen, storage information screen, maintenance screen and SNMP screen. The home screen shows the status of each port. Actual settings vary depending on whether the port is being used for input or output. Listed information for inputs includes the source video format (HD/QFHD/4K) and the video format of the file to which it is recording is in progress. 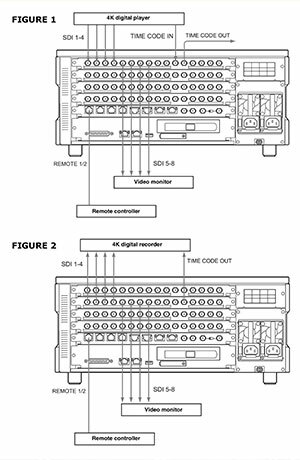 Also visible at a glance are timecode, port setting, recording mode, loop mode, available memory capacity and audio track mode (SDI, NMI or AES/EBU). Listed information for outputs includes the output video format, file name, timecode, port setting, playback mode, playback status (close/stop/playback speed, shuttle, jog, variable speed and still-frame). As EVS has cornered the market in live replay, this server would be Sony’s best chance to regain some share by investing in making this a real competitor. To facilitate this, there needs to be more development for AVC Intra, MPEG and XDCAM codec support and more audio channels with MADI support. A simplified networking system would also be useful as the current ‘Share Play’ is rather difficult to implement. I would also like to see the designers eliminate the current need for a Windows-based production control workstation, as IP networking isn’t high on the list of skills of many broadcast engineers. It would be useful to increase the amount of channels one server can handle as the competition is already capable of 12 channels of HD or 6 channels of 4K. Also, it would be good to be able to use a second or third remote panel, or split the configuration to act like a pair of four-channel or six-channel servers. Seamless integration with EVS networks would be a great help if commercially possible. As it stands, the best feature of this product is ingest/playback, as opposed to live replay. While most of the slow-motion production server manufacturers offer SDI/IP hybrid compatibility, one of the biggest selling points of the PWS-4500 is its smooth connectivity to Sony high-speed HD and UHD cameras. Another is its outstandingly robust build quality. While other servers rely on fragile hard drives, the PWS-4500 uses stable non-volatile NAND flash memory. Picture quality is excellent thanks to the XAVC codec efficiency, with very smooth slow-motion, Full HD, UHD and real 4K resolution plus high dynamic range compatibility. The ability to cut Full HD video from up to three recorded UHD sources, even in 2x speed, without needing any additional hardware, is a major operational advantage. The PWS-4500 is also highly competitive price-wise for a full-featured true high-end production server. Price point is between £45,560 and £53,500 depending on configuration.